Blackjack is, by far, the most popular game in any casino, and is the most widely played card game in the world. The game of Blackjack owes its’ popularity to the fact that it is so easy to play and highly addictive. It’s fast-paced, exhilarating and best of all, it’s a game in which you can use your own strategy to play, so players feel more in control when playing Blackjack than they would playing games of pure chance. Blackjack is the perfect game for parties, weddings and functions because it’s easy to jump in and out of the game as often as you wish. Each hand takes approximately three minutes to play, so players can approach the table, play a few hands, then walk away and get a drink, have a dance or speak to friends and colleagues, and then pop back to the table whenever they like and continue playing. This makes for a very relaxed, informal and straightforward gaming, making Blackjack the ideal game for a party. At Harlequin Fun Casino, we have beautifully handcrafted immaculate Blackjack tables for hire, complete with authentic Las Vegas Casino playing cards which we buy directly from the top casinos on the Las Vegas Strip to add an extra layer of authenticity to your casino experience. Our tables are luxurious and impressive, and make a really beautiful addition to any venue, or gathering, whether large or small. 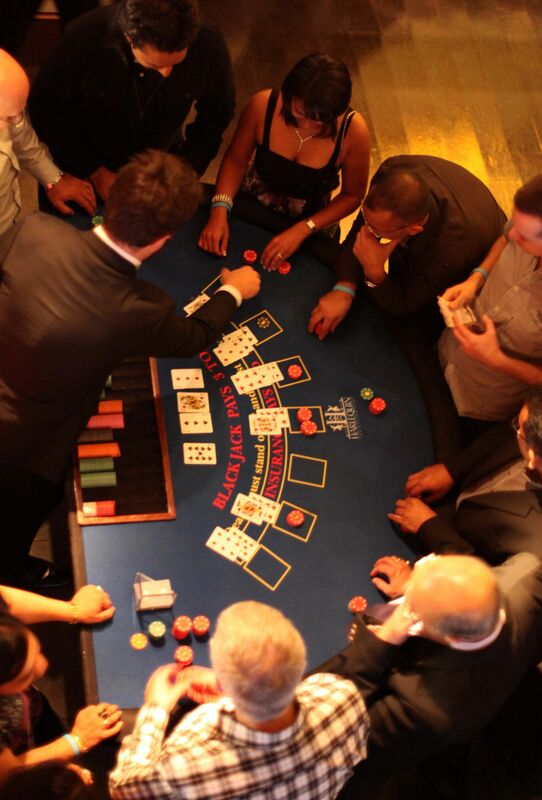 Each Blackjack table can take up to 8 players at any one time, so if you’re hiring a DJ or band alongside your casino, we recommend hiring one casino table per 30-40 guests. 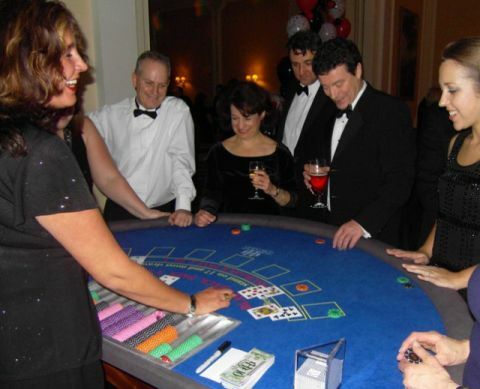 If the casino is the main attraction of the night, you might choose to hire more casino tables, but the choice is yours. The most important thing is that everyone gets the chance to play, and we’ve never yet been to a function where we’ve had quiet tables in need of more players! The Blackjack table is the semicircular table, four foot wide and three foot deep, and can take anything up to 8 separate players at any one time. Blackjack is a card game, in which each player is playing against the dealer, and not against each other. Firstly, players place their bets before they get dealt their cards. Once everyone has placed a bet, each player is dealt two cards to begin with, face up on the table. The dealer deals herself two cards, one face up and one face down. The aim of the game is to get as close to 21 with your playing cards as you can without going over or ‘busting’. You’ll need to beat the dealer to double your money. If she beats you, you’ll lose your bet. If she busts, everyone wins. The cards from 2 through 9 are valued at their face value. Once you’ve received your two cards, add them together, and decide whether you want to take another card to add to your initial two to try and get closer to 21. If you do, you must ask the dealer for another card by saying “Hit” or “Twist”. The dealer will then issue you with another card. If that card takes you closer to 21, and you’d like to stay where you are, you say “Stick” or “Stand” and the dealer will move onto the next player. If, however, that card “busts” your hand, you’ll lose your money and be out of that particular hand. Once all of the players have decided whether to “Stick or Twist” the dealer will show what cads she has. She has o keep “Twisting” until she hits 17 or more. As soon as she hits more than 17, she must stay where she is. Providing she doesn’t bust, the dealer will pay each player who beat her hand, and will take the chips from anyone who she beat. If, however, her hand busts, everyone at the table who still has cards in play will win. These are the basics of Blackjack, and even people who have never played a single game in their lives can be taught the simple rules within a few short minutes. 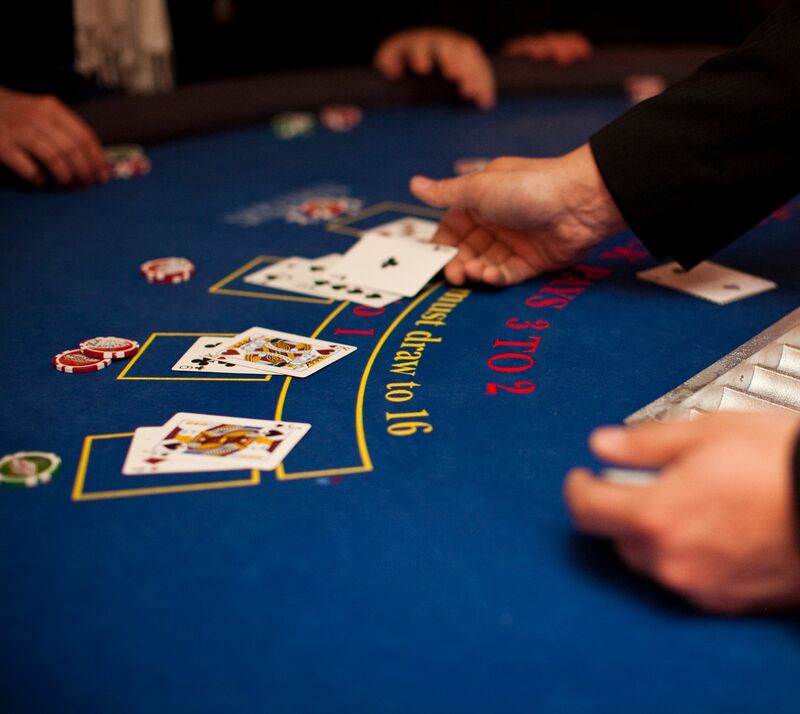 Our expertly trained professional croupiers will be more than happy to explain the rules to new players as your event progresses, and will endeavour to teach everyone who wants to know the finer points and basic strategies which can be played throughout the game. There are several extra rules and options available to you depending on what cards you are holding which your croupier will explain to you as you gain more confidence in the game, so don’t feel like you need to know everything before you start, but for those wanting to know a little bit more about the finer points of Blackjack, here are some of the other rules. This can only be done with a two card hand, before another card has been drawn. Doubling down allows you to double your bet and receive one, and only one, additional card to the hand. A good example of a doubling opportunity is when you hold a total of 11, say a 6 and a 5 against a dealer’s up-card of 5. In this case, you have a good chance of winning the hand by drawing one additional card, (in this case, a 10) so you might as well increase your bet in this advantageous situation. The dealer will deal one additional card to the hand. When you are dealt a matching pair of cards (which means any two of the same value) you have the ability to split the hand into two separate hands, and play them independently. Let’s say you are dealt a pair of eights for a total of sixteen. Sixteen is the worst possible player hand, since it is unlikely to win as is, but is very likely to bust if you draw to it. Here’s a great chance to improve a bad situation. Simply split the cards apart, and then place a matching bet beside the original bet in the circle. Note that you must bet the same amount on a split, unlike a double-down, where you are allowed to double for less. The dealer will separate the two cards, and treat them as two independent hands. If you get additional pairs (in the first two cards of a hand), most casinos will allow you to re-split, making yet another hand. You are allowed to split any 10-valued cards, so you could split a Jack and Queen hand. However, this is usually a bad play: If you have 0 already, you should stay where you are as the chances are you will beat the dealer with 20 and win. Always split pairs of Aces.